One of the best things about getting married is inheriting your spouse’s family – a whole new set of wonderful people to spend your holidays with, to share home movies, and to create new memories with. Don’t get me wrong, the experience can be stressful; splitting time between your family and your spouse’s family is a tricky rope to navigate if both are within driving distance. But if you have an aunt and uncle like Aunt Libby and Uncle Lou, you never have to worry about those things. I married my wife nearly one year ago on October 6 and on that date I inherited Aunt Libby and Uncle Lou, two of the most wonderful people I had ever met. They are the kind of people who are honest and sincere, the kind of people that, when they hug you, grab you like you have been in the family for a million years. They host Thanksgiving, take you to lunch just because, and would give you the shirt of their back if you needed it. When I heard the Phillies brought up Luis Garcia, I flipped out: Uncle Lou (Garcia) was a lifetime Phillies fan and now there was a player with the same name on the Phillies. How neat is that? But then I heard more about the Phillies’ Luis Garcia: how he pitched to a 11.57 ERA in the independent Atlantic League last season, gave up on his baseball dream, and went to school to become a barber; how he was added to the Phillies’ extended Spring Training crew; and how he earned a call to High-A Clearwater then Reading then Lehigh Valley and by July 10, he was in the Major Leagues pitching a scoreless inning against the team that gave up on him. The two Lou Garcias couldn’t be more different, one a successful IT professional, husband, and father, the other, a mid-90s throwing Major Leaguer, but their stories and warmth couldn’t be more similar. The way Uncle Lou tells the story, he and Aunt Libby were in a band together, singing the hits of Jefferson Airplane and Big Brother and the Holding Company, he on drums, Aunt Libby matching Grace Slick and Janis Joplin note for note, playing all of the top spots in Brooklyn. Lou had taken a liking to Libby but the feeling wasn’t 100% mutual at first. Lou was persistent, Libby fell in love, and the rest is history. That might be the perfect way to describe professional baseball’s attraction to Luis Garcia. The Phillies’ righty was signed nine years ago by the LA Dodgers out of the Dominican Republic. Impressed by a 6’2″ build and a low-90s fastball, the Dodgers held on to Garcia until August 31, 2009 when they traded him to the Washington Nationals for Ronnie Belliard. Garcia remained with the Nationals organization through 2010, reaching High-A Potomac but struggling in 8.2 innings pitched. After the 2010 season, Garcia told Bill Evans of the South Jersey Times that his agent disappeared. Thinking he no longer had a shot at professional baseball, Garcia retreated to north New Jersey to become a barber and a part-time baseball instructor. Garcia got the itch to pitch again in 2012 after taking the 2011 season off and pitched for the independent Newark Bears, with almost no success (11.57 ERA in 16.1 IP). Not deterred, Garcia went to a Phillies try out in January 2013. He didn’t hear anything for a few weeks but then received a call to report to extended Spring Training. Garcia, 26, came back to professional baseball refreshed and came to the Phillies organization at a time when they desperately needed bullpen arms. He dominated in 14 appearances in Clearwater, followed by a successful 11 game stretch in Reading. Garcia had a sub-one ERA in eight appearances for Lehigh Valley before making his first Major League appearance on July 10, 2013, striking out one in a scoreless eighth against the team who gave up on him, the Washington Nationals. Garcia did not make his way to the Majors based solely on the attrition of the players around him. Garcia struck out 8.9 hitters per 9 IP in 2013 en route to the Phillies with a fastball that averaged 94 MPH. 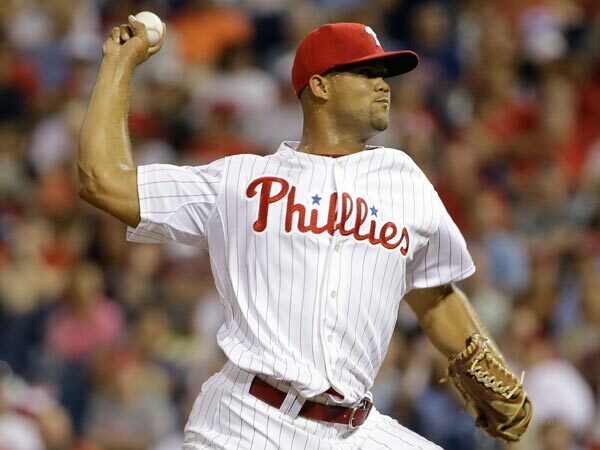 Garcia relied on a fastball/slider combo and was effective in 24 games with the Phils. Yet, there were holes in Garcia’s pitching. For one, Garcia struggled with command. Despite his .237 BAA and 3.73 ERA, Garcia allowed a team-high 6.61 BB/9 IP. Garcia, for his part, got lucky stranding base runners: despite his 1.60 WHIP, he managed to strand 76.9% of runners. The high number of base runners combined with a high LOB% translates into very high FIP (5.12) and xFIP (4.92). But, for a guy who was a barber as recently as mid 2012, Garcia pitched very well. Grade: C+. As touching as Garcia’s story is of making the Majors after all but giving up, and as wonderful as the positive association with Uncle Lou by namesake is, Garcia was a pretty average pitcher who has room for improvement with a hot fastball and a slider with movement but poor control. Garcia will be an interesting name to follow in Spring Training next season; if he continues to improve, he could be among the more steady options out of the Phillies bullpen for 2014. As for Aunt Libby and Uncle Lou, they know and I know that their grade for 2013 was an A+. Best of luck to them as they settle into their new home and congratulations to my newest cousins Adam Garcia on his Emmy nomination and Chris Garcia on graduating from Rowan University and on his new job.